Tecno G9 Phantom Pad 2 is a refresh of Tecno’s 8-inch tablet. The screen of Tecno G9 Phantom Pad 2 is not exactly 8-inch, but 7.85-inch (almost 8-inch). From the specs this mobile phone is almost similar to the Phantom Pad. But, the Tecno Phantom Pad 2 offers a sweeter design with slimmer bezels with improvement in display quality for a better experience when watching movies or browsing the web. Under the hood, the Tecno Phantom Pad 2 is basically the same tablet. It runs Android 4.2 (Jelly Bean) on a 1.3GHz quad-core processor with 1GB RAM. The difference between this two smartphone is that the 2013 Pad came with 1.2GHz quad-core, which is not much of a difference on paper. However, given that Tecno have been playing with Jelly Bean for over a year now, we expect the Tecno Phantom Pad 2 to be better optimised for Jelly Bean and hence run more smoothly. Tecno Phantom Pad 2 has a 7.85-inch IPS touchscreen with 1024 x 768 pixels resolution. It sports a 5 megapixels camera on the front and on the back. The rear camera comes with autofocus and LED flash with recording of 720p HD quality videos. Where to buy Tecno G9 Phantom Pad 2 in Nigeria. We currently have no information on pricing and availability for Nigeria. 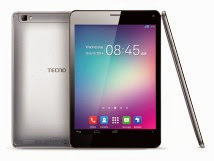 Tecno Phantom Pad 2 price in Nigeria is expected to range from N35,000 to N45,000 at launch.